It’s really starting to feel like I’m back! I’ve spent the last two months being almost singularly-focused on my hip surgery. I had two weeks to get everything lined up for my out-of-state surgery and being out of work for a month and a half. Then after the procedure my world initially was a fairly regimented schedule of pills, injections, ice packs, braces, weird machines on and around me, and those absolutely terrible anti-blood clot stockings that were the bane of my existence. My mom and then my sister (and baby niece) came down to help take of me, and I worked a ton from home, but the scope of my world basically shrunk to my living room. My mom and sister left three weeks after the surgery, when I was able to start driving again (I’m still driving left-footed out of fear for my right hip). Since then I’ve basically just been trying to do the bare minimum, getting up and down my condo stairs, starting to wean myself off crutches, getting all my physical therapy in, working from home, and then collapsing at the end of the day. I’ve re-watched two seasons each of Bones and Castle, and devoured three seasons of Buffy the Vampire Slayer on Netflix (Buffy + Angel 4EVER, amirite??). I haven’t been making anything new lately (as you may have noticed), surviving on pre-made food and leftovers from when my sister was here. And cheese. But now, finally, I seem to have turned a corner. Beyond throwing pasta with various fixings, this recipe was a first try at really cooking something (besides boiling up ravioli or baking a Kashi pizza). I knew it would need to be fast and easy, since I didn’t want to spend lots of time on my feet—I still tire really easily. And I’m still obsessed with my grill and want to use it as much as I can before it gets cold out. 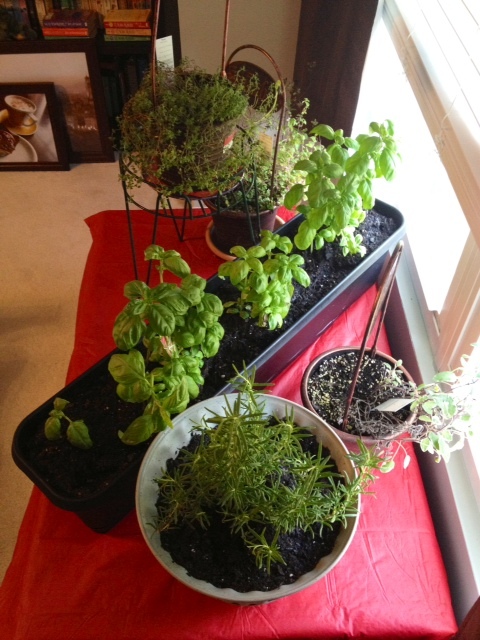 Plus, my mom planted me this awesome indoor herb garden while she was here. Isn’t that the BEST?! The only places in my entire condo (including the patio) that get direct sunlight are the two bedroom windows, so we put this in the guest bedroom. She planted tons of basil (my favorite! 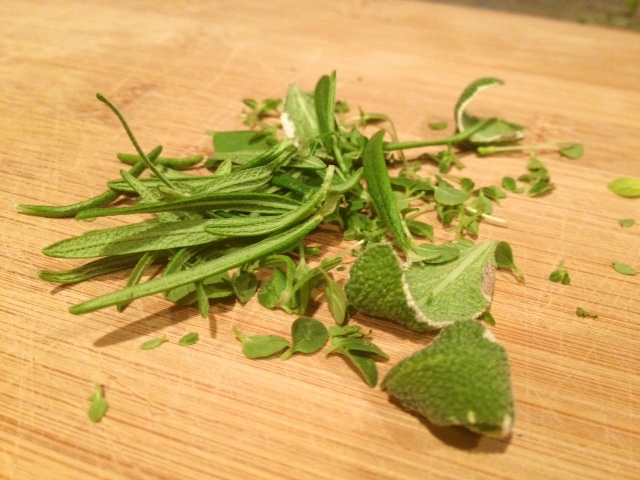 ), rosemary, oregano, sage, and thyme. I’ve been doing my darnedest to keep them alive since she left, though I think the sage has shuffled off this mortal coil. It wasn’t terribly hardy. It’s not my fault! Mom, if you’re reading this, I promise I took care of it…the sage just had no will to live. 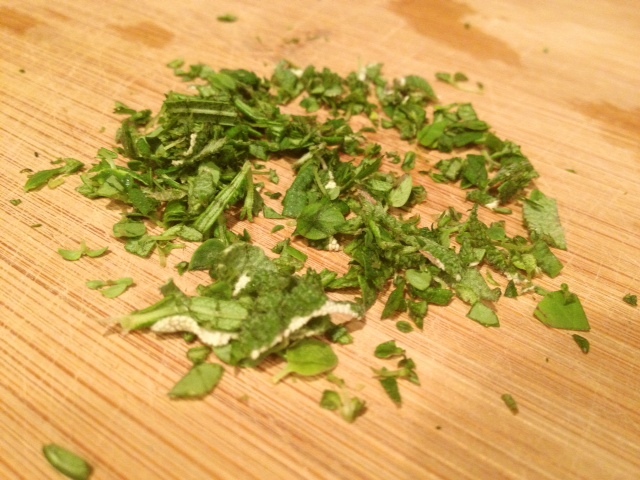 Man, fresh herbs are the best. I used a combination of the rosemary, thyme, oregano, and sage for this dish. I was worried the basil would be too overpowering, so I left it out. 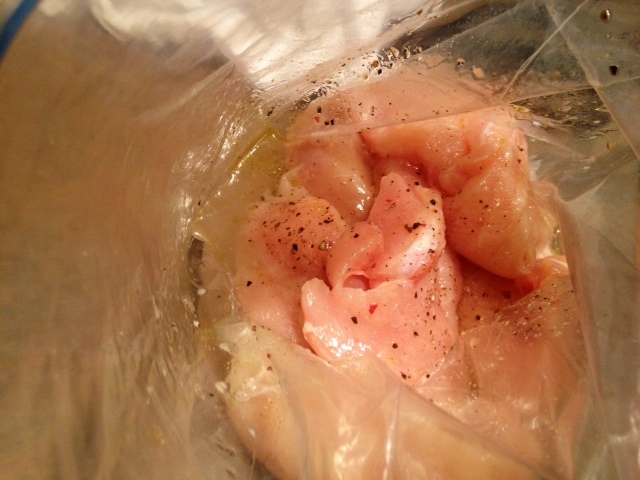 Place the chicken breasts in a large ziploc bag and season with salt and pepper. Pour the olive oil and wine in the bag. Mince up the fresh herbs fairly fine and toss in the plastic sack. Smoosh everything around to get it evenly coated. Let it marinate in the fridge for as long as needed, from a half-hour to several hours. 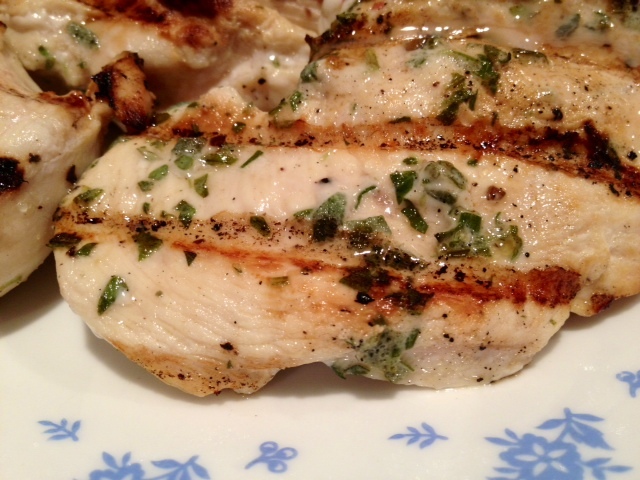 Remove it from the fridge about a half-hour before grilling so it can come to room temperature. Heat the grill to medium-high (a 4 out of 5 on my grill, around 400-450 degrees). 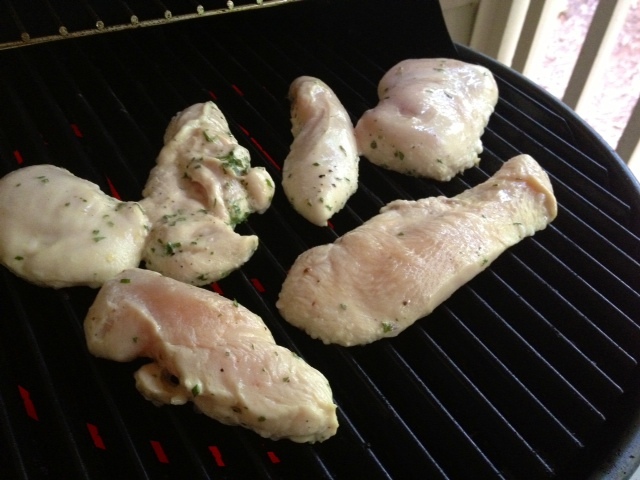 Place the chicken breasts on the grill and let them cook for about 4 minutes. Don’t mess with them during that time, you want to make sure they get good grill marks on them. Turn the chicken onto the other side and let cook another 3-5 minutes depending on doneness. 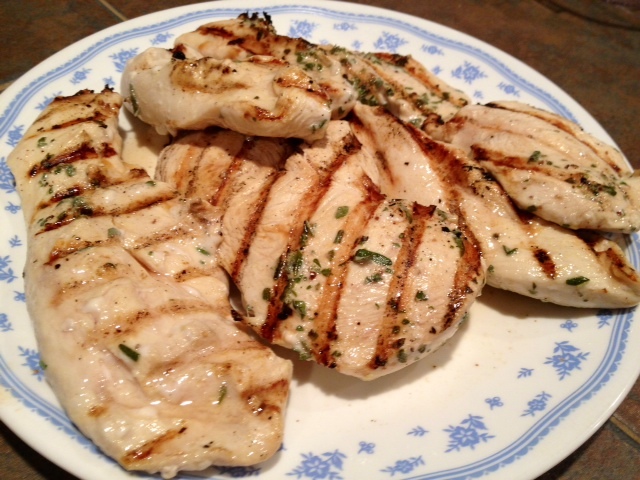 Remove from the grill and let them sit on a plate for 10 minutes to get the juiciness set. 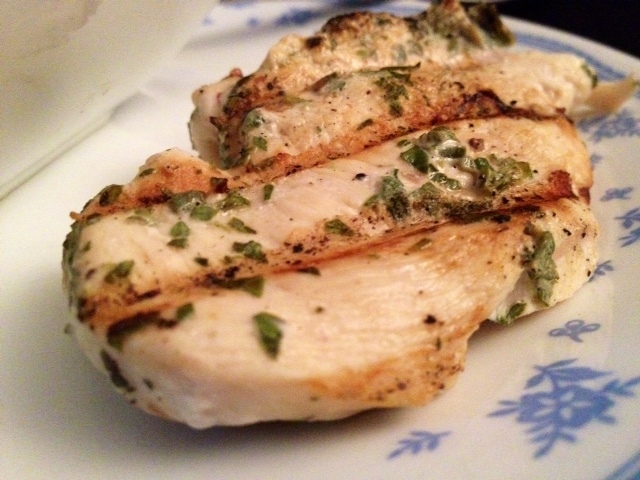 The wine combined with the herbs gave this such a bright, fresh flavor! This would be the perfect recipe for early spring once all the herbs have popped, and it goes well with just about any side dish. Throw the leftovers in with pasta, veggies, whatever—it will be awesome! 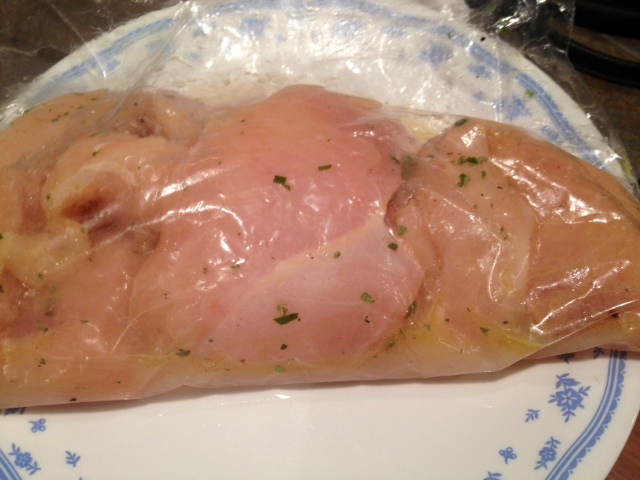 Place the chicken breasts in a large ziploc bag and season with salt and pepper. Pour the olive oil and wine in the bag. Mince up the fresh herbs and toss in the plastic sack, then smoosh everything around to get it evenly coated. Let it marinate in the fridge for as long as needed, from a half-hour to several hours. 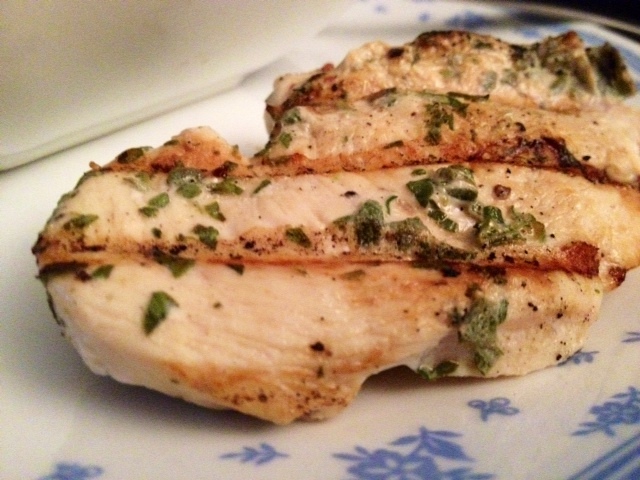 Remove the chicken from the fridge a half hour before cooking. Heat the grill to medium-high (a 4 out of 5 on my grill, around 400 degrees). 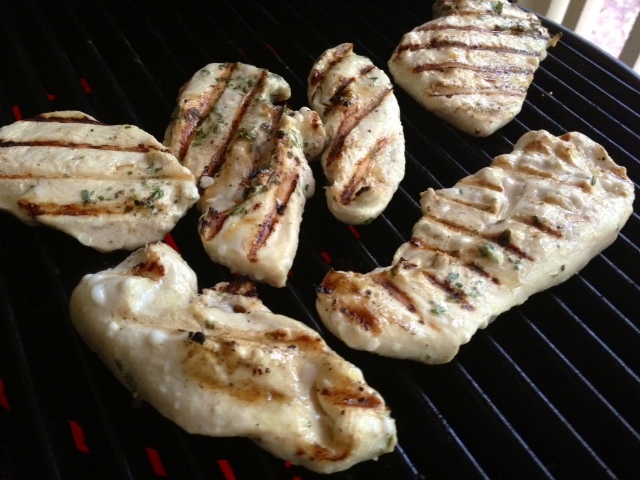 Place the chicken breasts on the grill and let cook for around 4 minutes, making sure they get good grill marks on them. Turn the chicken onto the other side and let cook another 3-5 minutes depending on doneness. 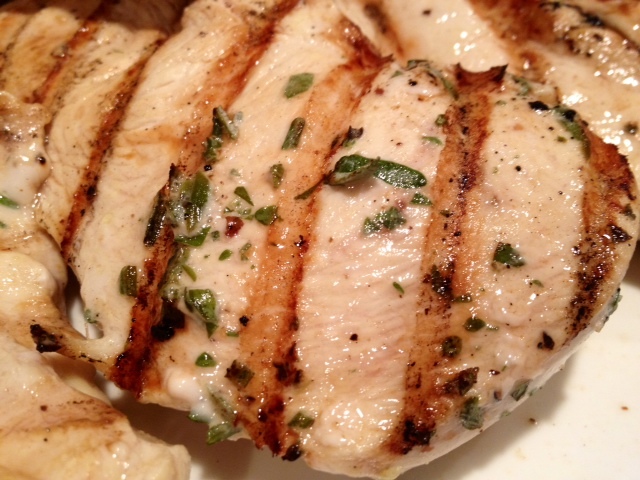 Remove from the grill and let sit on a plate for 10 minutes to get the juices set.